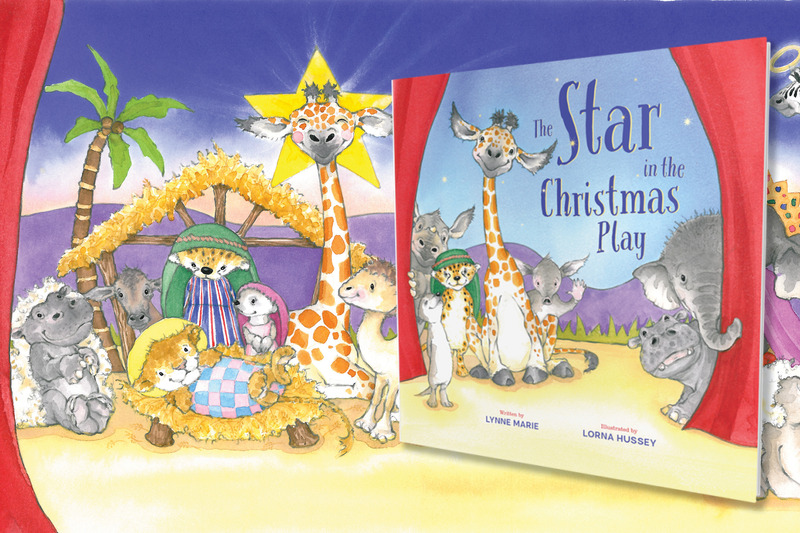 Today we are celebrating the publication of The Star in the Christmas Play! We talked to author Lynne Marie about her writing process and holiday traditions. Q: Tell us a little about your background. Have you always wanted to write children’s books? A: I have loved books since my first trip to the children’s department of the public library where I lived in Smithtown, New York. I have wanted to be a writer since I began to write stories in the 3rd grade. Consequently, none of those stories have been published, although I do vividly remember one that featured the Tasmanian Devil. A: While raising my children, I saw little ones wanting to achieve something that seemed impossible. In the throes of creativity, this situation mashed with one of my daughter’s stuffed giraffe, Raffi. Once I had the main character and researched giraffes, I knew that height should be his challenge. I have a theatre background and love plays and musicals, so I immediately leaned toward the main character wanting to be a star. My own challenge became figuring out how a giraffe would overcome the problem and be a star. I started to scribble famous stars, both movie stars and constellations. After contemplating what stars (in any form) were most famous and recognizable, I came up with the North Star and the Star of Bethlehem. As soon as the Star of Bethlehem entered my imagination, everything came together, and I knew just how to write the entire story. Q: What excites you about this story? A: So much! I am so happy with how the idea developed and became something accessible to all children. I hope that once they take time to believe in themselves, they will achieve their desired goals, although maybe not in the way that they originally imagined. It is my dream that all children are blessed with the ability, or perhaps learn, to be happy with who they are and what they can be, regardless of any limitations. I am also so happy and excited that Beaming Books chose to go with Lorna Hussey as the illustrator. She illustrated my second picture book (which also features animals), and I knew she would be perfect to draw my savanna babies. Also, I have been collecting Christmas books since I was a small child and am over-the-moon excited to have published a holiday book to add to my collection! I am pleased to have done it in a way that captures one of the key components of Christmas, which is BELIEVE, whether it be in yourself or in God. Q: What’s your favorite part about Christmas? Do you have any special holiday traditions? A: Christmas has always been one of my favorite holidays. I was the oldest child, but and was always first to bug my parents for us to put up the Christmas tree and last to agree to take it down. One of my favorite duties each year was being able to set up the Nativity Manger. Now that I think about it, this beloved memory likely played a huge part in the conception of this story. I am so thankful to see my beloved manger come to life in a picture book! Another special holiday family tradition (started by my father), occurred during advent. On each Sunday after church, Santa would secretly ring the doorbell leave gifts on the stoop for us all to enjoy together. It’s a tradition that I have carried on with my own family—leaving gifts such as a Christmas movie, a game or puzzle, or ingredients for cookies or a gingerbread house to make together. A: I especially want them to know that despite religion being a backdrop for this book, the story can be accessed by anyone and everyone. There’s a subtle message here that would appeal to children and adults alike who doubt what they can achieve and need to believe in themselves. To learn more about The Star in the Christmas Play, click here.